We offer a complete payment solution for businesses by enabling them to accept online and mobile payments. Keep your business running 24/7 and stay in touch with your customers with features designed to meet your needs in the digital world. Our secure payment options give your customers the flexibility of choice and ensure that no one is locked out on the basis of payment. Never miss a sale! Integrate in minutes! 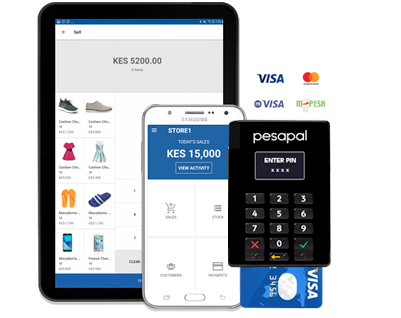 Integrate your website with Pesapal API and get access to all payment methods available at one go. Our API is free and public for anyone to use! We have created plugins for more than 10 popular systems. Install our plugins for popularly used CMS and get access to all payment methods available at one go. From the budding entrepreneur to the large enterprise, our online business tools are tailor-made to your industry needs to enable you to grow your business. Manage your payments better using tools that enhance your customer’s experience. Provide your business details and get an account & information useful in integration. Sign a merchant agreement and have your account activated and ready to transact. Start collecting payments through a simple, secure and reliable process. Leverage on the diversity of the Pesapal ecosystem. Keeping proper records is key to successfully managing your business. Duka Manager is an easy to use tool that allows you to keep records of all your business activities from one secure app.